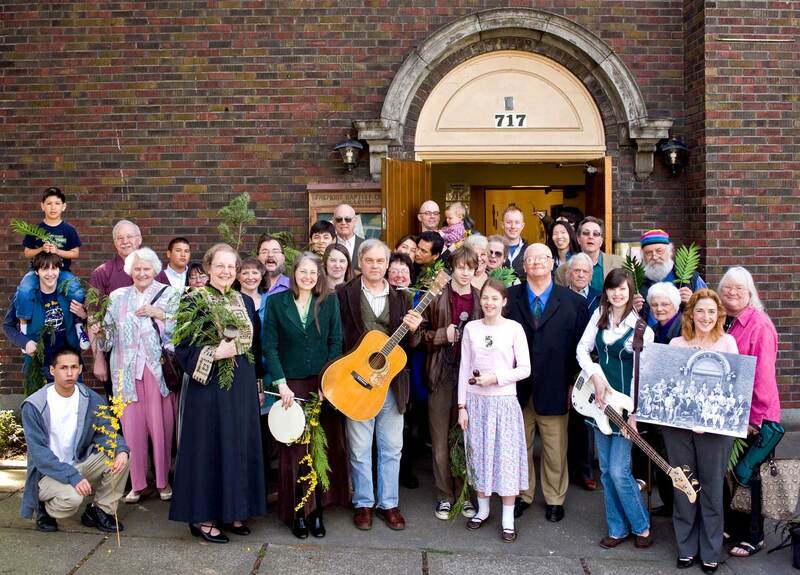 NOW: Members of the congregation mingle with Palm Sunday’s musicians at the front of the church on April 5, last. Judy Gay, the church’s pastor, stands in her pulpit robe in the front line, left of center. Many Seattle churches got started in the 1890s in what were then Seattle’s suburbs with help from their “mother churches.” For Fremont Baptist that was Seattle First Baptist. These Baptists of Fremont also got help from a railroad car. The Evangel, a Baptist “Chapel Car,” arrived in the late winter of 1892 and was switched onto a spur near the Bryant Lumber Mill, Fremont’s big employer then. With 26 northend Baptists meeting on board, the church was organized on March 20. Fremont Baptist was also distinguished by its music. 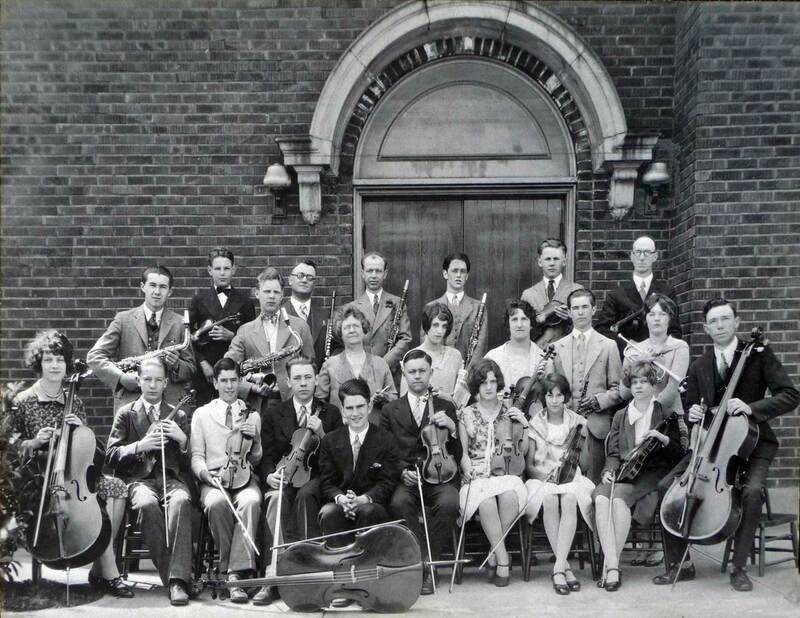 Still neither the date nor most of the members of the church orchestra shown here are identified. An exception is the postman-cellist Jesse Willits, posing far right and three seats to his right (your left) his violinist wife Rowena, in white. 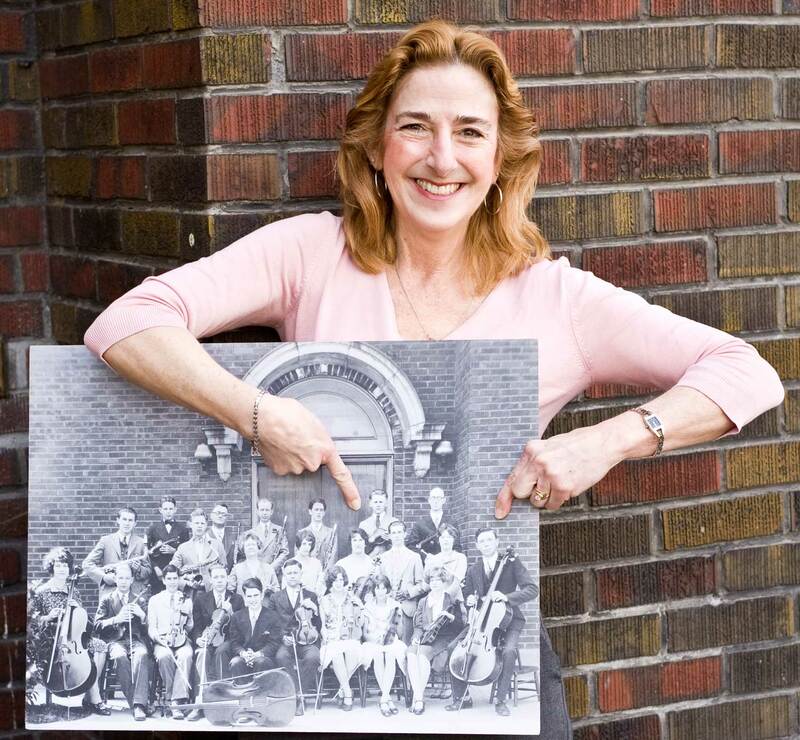 In the “now” photo far right, Jesse and Rowena’s granddaughter Mary Allen holds in the place of her forebear’s cello a photo blow-up of the historical scene. Next Sunday, May 17, from 2 to 5 p.m. Fremont Baptist and the Fremont Historical Society are co-sponsoring an Open House of the church at 717 N. 36th St. Tours and an exhibit of church and neighborhood photographs will be musically accompanied by the church’s Estey pipe organ, which started life as a theater organ in Bremerton. Mary Allen, a 3rd generation Fremont Baptist, points out her grandmother Rowena Willits. Dedicated on March 24, 1901 the wooden sanctuary was 44x66 feet and built at a cost of $3,200. Especially important for a Baptist congregation it had a baptistery, but Fremont Baptist had no basement. That was added later. Between 1919 and 1924 more contiguous lots were bought on the site and on April 7, 1924 ground was broken for the new sanctuary, which was dedicated only a few months later on December 7. This picture is most likely a record of the ground breaking for the congregation’s new home, which was started first beside its old home. I found this historical article and the photos via a friends Facebook page. It was good to read the history and great fun to see the smiling faces of today, standing in the entrance. My great grandfather, Rev. Samuel G. Reading, was one of Fremont Baptist’s ministers; my mother Louise was one of the “stalwart” members. My sister and I grew up at Fremont. Many good memories and good people.